Ahead of May Day, David Harvey Details Urban Uprisings from Occupy Wall Street to the Paris Commune | Democracy Now! distinguished professor of anthropology at the Graduate Center of the City University of New York. His most recent book is Rebel Cities: From the Right to the City to the Urban Revolution. AMY GOODMAN: Tuesday is May Day, May 1st, also known as International Workers’ Day, a holiday that celebrates workers’ rights and achievements of organized labor, such as the eight-hour workday. This year, the Occupy Wall Street campaign is hoping to mobilize tens of thousands of people across the country under the general slogan, “General Strike. No Work. No Shopping. Occupy Everywhere”. Events are planned in 125 cities. The Occupy campaign plans to protest in 99 targets alone in Midtown Manhattan, including the offices of JPMorgan Chase and Bank of America. Activists gathered last Thursday in New York City’s Union Square to announce plans for the massive May Day protest that will include immigrant groups, workers’ unions, members of Occupy Wall Street. Chris Silvera is Secretary-[Treasurer] of Teamsters Local 808. CHRIS SILVERA: We want the immigrant community. We want Teamsters. We want laborers. We want the RSDWU. We want the United Food and Commercial Workers. This is a day that should be represented by hundreds of thousands marching like they did in 1886. We have to turn back the clock on Mr. Romney, on Mr. Obama, on the Congress, on Mario Cuomo, on Bloomberg. And the 99 percent has to get their share. 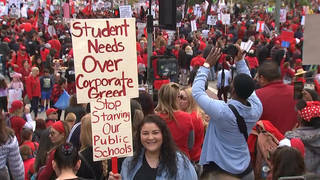 AMY GOODMAN: Well, to talk more about May Day and the Occupy campaign, we’re joined by leading social theorist, David Harvey, distinguished professor of anthropology at the Graduate Center of City University of New York. He has been teaching Karl Marx’s Capital for nearly 40 years, is the author of a number of books, including The Limits to Capital and A Brief History of Neoliberalism_. His most recent book is called Rebel Cities: From the Right to the City to the Urban Revolution_. DAVID HARVEY: I’m trying to look at the history of urban uprisings. And actually, if you look at the situation around the world right now, you see examples in Berlin. You see them in Cairo. You see them going on with the indignados movement in Spain, and of course in Greece. And you see them in Chile. And in recent years, we’ve seen uprisings in places like Los Angeles 20 years ago. And so, this—and I’m interested in the sort of political significance of these movements. And I think, in some ways, Occupy Wall Street is in that tradition. AMY GOODMAN: What was the Paris Commune of 1871? DAVID HARVEY: The Paris Commune was an uprising against the government in an attempt to create an alternative form of urban governance in Paris in 1871 under conditions of war and the like. And, of course, it was ruthlessly suppressed, as we see going on in Syria right now, in Homs, in fact, so that—so these urban movements can sometimes work, and sometimes they get savagely repressed. AMY GOODMAN: Moving forward from the Paris Commune, you talk about the right to the city. What does that mean? DAVID HARVEY: The right to the city means—who has the right to New York City? Who can affect things here? Who can really change life here? And when we talk about the power of the 1 percent, we’re talking about an extremely powerful group that actually dominates much of investment in the city, much of rebuilding of the city. We have a billionaire mayor who allies with them. But it’s hardly a city that is run by Picture the Homeless or the impoverished population. So, in claiming the right—in reclaiming the right to the city, what we’re really trying to talk about is the way in which ordinary people can affect urban life and define a different kind of urban environment in which they’re going to live. AMY GOODMAN: Earlier this month, New York City Mayor Michael Bloomberg compared the city council’s living wage bill to communism. The bill would raise workers’ wages at city-subsidized developments. Bloomberg made the comment in an interview on WOR radio. MAYOR MICHAEL BLOOMBERG: If you think about it, the last time you really had a big managed economy was the USSR, and that didn’t work out so well. You cannot stop the tides from coming in. We need jobs in the city. It would be great if all jobs in the city paid a lot of money and had great benefits for the workers—not good for the employers—but if you force that, you will just drive businesses out of the city. AMY GOODMAN: That was Mayor Bloomberg. David Harvey? DAVID HARVEY: That’s the usual story. But look at the situation. The top 1 percent in New York City earns—on income tax returns, earns something like $3.75 million a year. That’s what the top 1 percent earns, on average. There are 34,000 households, nearly 100,000 people, who are trying to live in the city on $10,000 a year. Half of the population of New York City is trying to live on $30,000 a year. This is—the levels of inequality in the city are absolutely stunning, and they’ve increased immensely since the 1970s. And then [inaudible] say, who dominates urban life? Who dominates the decisions? Well, it’s the 1 percent. And so, I think what Occupy Wall Street and the rest is saying is that we only have one form of power, which is people on the streets, actions in the streets. We don’t have the power to dominate the media. We don’t have the power, the money power, to dominate politics. And this is the situation we are in. So Occupy Wall Street is trying to give a different mode of political expression to politics as usual. AMY GOODMAN: The Occupy movement has faced increasingly brutal police responses. In November, Democracy Now! spoke to Stephen Graham, who wrote Cities Under Siege: The New Military Urbanism, which looks at the increasing influence of military technology on domestic police forces. STEPHEN GRAHAM: Well, there’s been a longstanding shift in North America and Europe towards paramilitarized policing, using helicopter-style systems, using infrared sensing, using really, really heavy militarized weaponry. That’s been longstanding, fueled by the war on drugs and other sort of explicit campaigns. But more recently, there’s been a big push since the end of the Cold War by the big defense and security and IT companies to sell things like video surveillance systems, things like geographic mapping systems, and even more recently, drone systems, that have been used in the assassination raids in Afghanistan and in Pakistan and elsewhere, as sort of a domestic policing technology. AMY GOODMAN: That’s Stephen Graham, who wrote Cities Under Siege: The New Military Urbanism. You know, we have a law, Posse Comitatus, that says soldiers can’t march in the streets, but it seems the way authorities get around this is simply by militarizing the police. Professor Harvey? AMY GOODMAN: And the police did end all of the encampments. DAVID HARVEY: And the police have been doing it. And I think Occupy Wall Street is taking some inspiration, it seems to me, from the courage of the people in Tahrir Square or in Bahrain and all the rest of it, to say, “Look, things have to change. And we’re going to try to make this change come about in a peaceful way.” I mean, this is, again, one of the signal things it’s about. This is a peaceful form of demonstration, and it has been ruthlessly sometimes turned into a police riot. AMY GOODMAN: You talk about the creation of the urban commons. DAVID HARVEY: Yes. Well, amazing thing about New York City, for example, is there are all these public spaces, but is there a public space where we can set up the equivalence of the Athenian Agora and have a political discussion? And the answer to that is no. You have to apply for, you know, all kinds of permits, and it’s highly regulated. So the public space is not really open to the public. A lot of it is now, of course, turned into flower beds, and so we have a great place for the assemblage of tulips and so on, but we don’t have a place where people can assemble. And so, one of the things we’re going to try to do tomorrow is to set up places of assembly where we can talk about things. So there’s a sort of a free university in Madison Square Park. I’m going to be participating in that. Then many other actions of that kind, one aim of which is to try to liberate spaces in the city where we can have political discussions and where we can have open political dialogue. AMY GOODMAN: You talk about the party of Wall Street meeting its nemesis. AMY GOODMAN: —happening to prevent another foreclosure. Why do refer to the “art of rent”? DAVID HARVEY: —commons and everything else, the tendency is for the uniqueness actually to be destroyed by commercialization. AMY GOODMAN: Professor David Harvey, thank you for joining us. AMY GOODMAN: We’ll put part two on our website. Rebel Cities: From the Right to the City to the Urban Revolution.